Back in April, when the US Treasury yield curve was accelerating its flattening trajectory (with the 2s10s curve eventually dipping into single digit territory last week) and speculation was starting to emerge about the timing of the next recession as indicated by said flattening, we noted that JPMorgan's strategist Nikolaos Panigirtzoglou pointed out an "ominous" development: the forward curve for the 1-month US OIS rate, a proxy for the Fed policy rate, has inverted between the two-year and three-year forward points." As Panigirtzoglou wrote, such inversions had only happened three times over the past two decades: in 2005, 2000 and 1998, all leading instances of broader (2s10s) yield curve inversion, and precursors to major recessions and/or market crashes. markets have started pricing in end-of-cycle dynamics. Of course, the stock market - which back then was in rally mode - promptly ignored this "ominous" bearish signal from the rates market as traders bid up stocks to new all time highs five months later, with the S&P hitting its all time high of 2,930.75 on Sept 20. However, just a few months later, JPMorgan's April observation turned out to be quite prescient, because in the aftermath of last week's "not so dovish rate hike" by Jerome Powell (which may or may cost him his job), the two major topics across the financial community is whether the Fed made a "policy mistake", and how late in the "end-of-cycle" are we, even as the Treasury curve has flattened across various tenors, and the 2s10s appears to be just days away from inversion. So now that the market euphoria is long gone, and not a day goes by without the Dow seemingly tumbling by triple digits (as Bloomberg calculated, at its lowest point, in the past 6 days the Dow Jones has fallen 463, 679, 513, 77, 643 and 563 points), JPMorgan looks back at what lessons should have been learned by the the inversion at the front end of the US yield curve, and notes that this was arguably the biggest bearish signal for equity and risky markets more broadly, one which was largely ignored by most until it was too late. 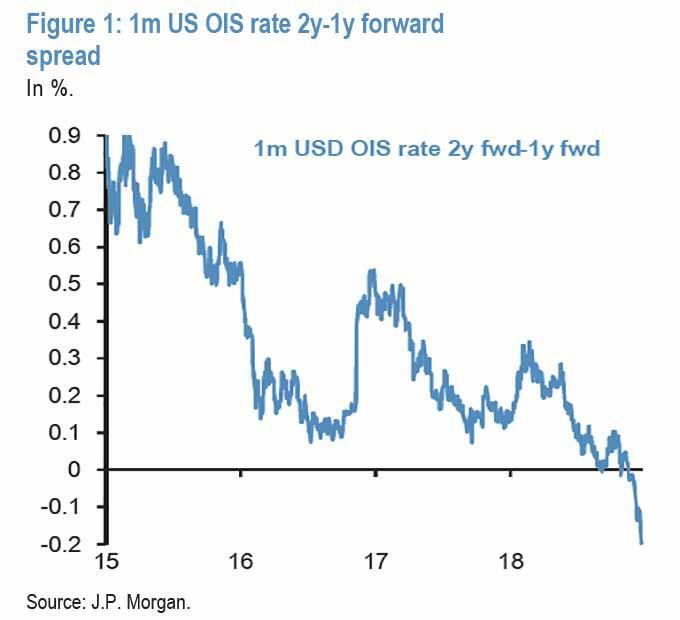 And while many may have missed this particular bearish sign, since April the inversion has not only been worsening by turning progressively more negative, but as JPM adds, also by shifting forward between the 1- and 2-year forward points since mid-November. 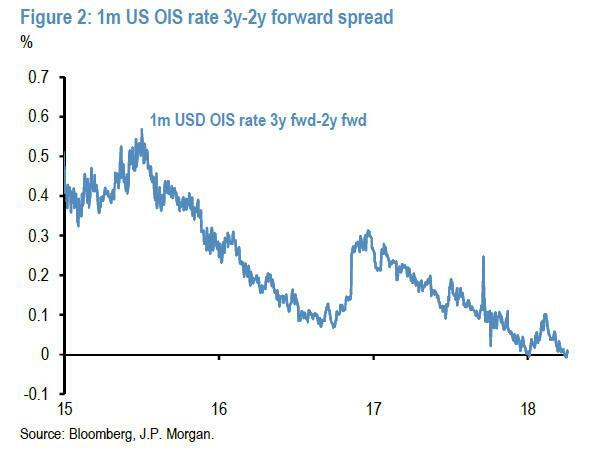 And this worsening continued in December with the 2- to 1-year forward spread of the 1m OIS rate declining below -10bp in the first week of December from -1bp to -2bp in mid-November. Things then went from worse to, well, more worse after this week's rather hawkish FOMC meeting pushed this 2- to 1-year forward spread to even more negative territory of -20bp, as now almost a full rate cut is now priced in by rate markets after the end of 2019. As JPM explains, "not only does this mean that this bearish indicator is worsening, but the hurdle to reverse the yield curve inversion is raised post this week's FOMC meeting." In other words, an even bigger dovish shift in Fed policy would be needed in the future for the yield curve inversion to go away and for markets to stop transitioning from pricing in a Fed policy mistake to end-of-cycle dynamics. Said otherwise, until and unless Powell makes it explicitly clear that he is planning on undoing the unexpected hawkish message sent by the recent FOMC, stocks will keep falling. 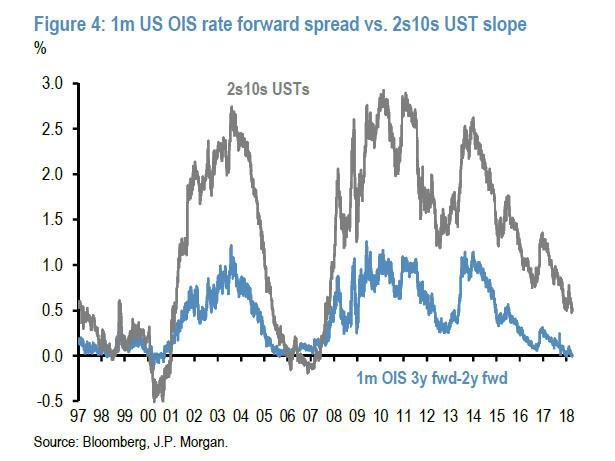 As for the one leading bearish indicator that all traders missed earlier this year, JPM hopes that they won't make the same mistake twice and just to make sure, notes that the "lesson learnt from previous cycles is that equity markets are unlikely to see a sustained recovery with the front end of the yield curve being inverted."